Take part in the Coca-Cola Evolution Revolution! This collectible vintage-style Coca-Cola Hobbleskirt Evolution Bottle looks great perched on a shelf, in a curio cabinet or even in an honored spot in your retro kitchen, rec room or game room. Collect the whole Evolution set and own a piece of Coca-Cola history! 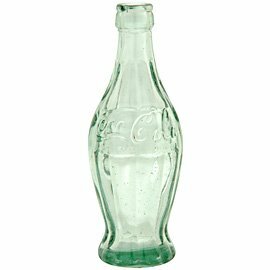 The Hobbleskirt bottle comes securely packaged in a clear-plastic casing that's ideal for displaying your Coca-Cola memorabilia. Printed on the packaging are significant dates in the history of Coca-Cola, along with a brief historical background. The inevitable confusion generated by the diversity and imperfections in the straight-sided bottle led to the adoption of the now-famous "hobbleskirt" bottle. The prototype of this bottle had a much more exaggerated hobbleskirt shape and was never put into production. This prototype bottle eventually led to the design of the more streamlined contour bottle that is so familiar today.